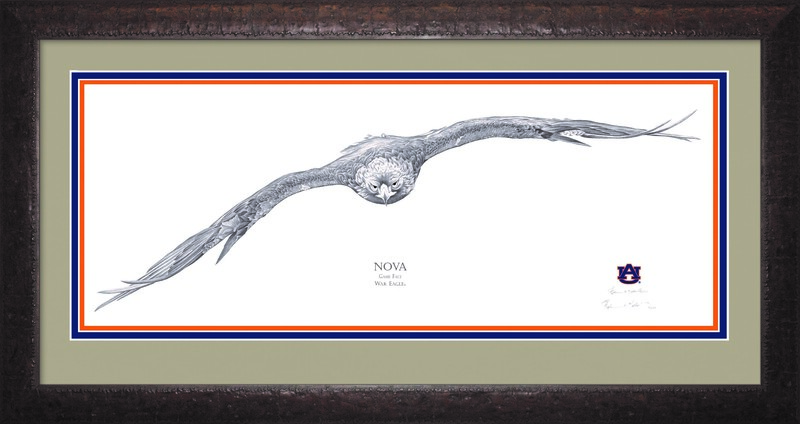 Nationally known pencil artist Stephen Malkoff has created a limited edition print of Nova, War Eagle VII, called “Game Face,” once again sharing his talents with Auburn University. Only 3,000 lithograph prints are being produced and a percentage of the sales will support the Southeastern Raptor Center, which cares for, trains and houses Nova and others birds of prey through an agreement with the U.S. Fish and Wildlife Service. The prints can be purchased online at www.Tiger30.com or by calling Malkoff’s Gallery at 888/410-3559. Handcrafted in the greatest detail, each print is signed and numbered by Malkoff and comes with a certificate of authenticity. Malkoff draws from photographs but meets with his subjects on several occasions to ensure he captures the subject’s personality. “I spend a lot of time to make sure that, when I am drawing, I’m capturing the spirit of the subject,” he said. “I think I accomplished that with Nova. Two years ago, he created a rendering of the famous Auburn Oaks at Toomer’s Corner. Malkoff studied architecture at Auburn and played football under legendary coach Pat Dye. He was a member of the 1988 SEC Championship team. The Southeastern Raptor Center has a three-fold mission of conservation, education and rehabilitation. Center staff and volunteers rehabilitate and release hundreds of injured birds of prey annually and conducts educational programs throughout the Southeast using non-releasable raptors as part of educational programs. While the game day flights of the eagle is uniquely Auburn, its role is to promote wildlife conservation, education and rehabilitation for the U.S. Fish and Wildlife Service and the Auburn University College of Veterinary Medicine’s Southeastern Raptor Center.